Here is an update comparing the standard "blue line" estimate of poll trends with the more sensitive "red line", and a simple 5 poll moving average for comparison. I talked at length about these estimators and issues related to them in an earlier post here, so won't comment further. See the earlier post for details. These data include polls released through December 29, with ARG's 12/26-28, Research2000's 12/26-27, Strategic Visions 12/26-27 and LATimes/Bloomberg's 12/20-23,26 polling as the latest from Iowa. As we pour over the latest data, it is worth taking a look back at a previous year in Iowa. The Democratic contest in 2004 was strikingly dynamic, with a sudden surge for Kerry and Edwards as Gephardt and Dean slumped. (And note the gap in polling. Those are the holidays we are in right now when polling wasn't done.) By the last polls, Kerry had established a clear lead, but Dean, Edwards and Gephardt were within four points of each other. The polling got the trends pretty close to right. Edwards was clearly on his way up through the last 12 days of the race, as was Kerry. Dean may or may not have reversed his fall in the last week, and the polls said Gephardt was coming down. So far, so good. But the Democratic caucus process does a lot to change the outcomes, with supporters of non-viable candidates joining forces with their second choices. That process is likely to boost the well off candidate, while robbing the struggling campaigns. And of course there is always the issue of which candidate's supporters actually turn out on caucus night. The entrance poll is the best measure we have of whose supporters actually show up on caucus night, even with all the appropriate cautions about the entrance poll itself. Comparing the entrance poll to that last estimated trend value for candidate support from pre-caucus polling, we can see how the two rising campaigns did even better than the polling predicted. Kerry's last poll trend estimate was 25.9%, good for first place. But his entrance poll support was 34.8%. For Edwards, his final trend estimate was 21.4%, but the entrance poll found 26.2% supporting him. For Gephardt the story was the opposite. His supporters stayed home on caucus night. The pre-caucus trend had Gephardt falling but at 17.8%. But the entrance poll found only 10.3% to be Gephardt supporters. Dean was the only top candidate whose preelection and entrance poll numbers match closely. His trend estimate was 20.3% and the entrance poll put his support at 20.5%. Then they vote. And form coalitions with non-viable supporters. And weight the delegates in a complex formula and finally there is an allocation of delegates to the state convention. That allocation is the best we can do to consider a "final" outcome of this process. The results there further favored Kerry and Edwards. Kerry moved up to 38% of delegates, from 34.8% in the entrance poll and 25.9% in the pre-caucus poll trend. Edwards got 32% of delegates, up from his 26.2% in the entrance poll and 21.4% in the poll trend. Dean ended up with 18% of delegates, down a bit from the 20.5% in the entrance and 20.3% in the poll trend. And Gephardt's delegates just about matched his entrance poll, 11% of delegates and 10.3% in the entrance poll. A disappointment from his 17.8% final trend estimate. So let's take one important lesson away from this Caucus Past. The pre-election poll trend got the order of finish right, if only by a point separating Edwards and Dean. But the process of caucus night that makes it tough to come out means that enthusiastic supporters are more likely to turn out than those who are discouraged by recent slippage. That is probably true for both parties. On the Democratic side, the complex voting and coalition formation further exaggerates the lead of the top candidates and diminishes the showing of marginal ones. And that process is seen even in comparison with the entrance polls, let alone the pre-election polling. In Iowa the "outcome" is quite a few steps removed from the simple balance of preferences among the population. The mechanisms themselves intervene to affect the final delegate counts. So don't expect to see the pre-election polls hit the final delegate percentages very closely. If the polls get the order right, that will be good enough. For a fair test of how good the polling is this year, wait for New Hampshire where pollsters poll, voters vote, and they just count up the results. Voters in the early primary states are making up their minds, or at least picking a candidate when pollsters call. For all that has been written about how unsettled the races in both parties have been, we are now seeing a clear decline in the rate of "don't know" answers to the vote question. Interestingly, that trend is clear in the earliest primary/caucus states, but only faintly visible if at all for the nation as a whole. This is further evidence that early state voters really do pay more attention and move to a choice sooner than the nation as a whole. Looming election days concentrate the mind apparently. 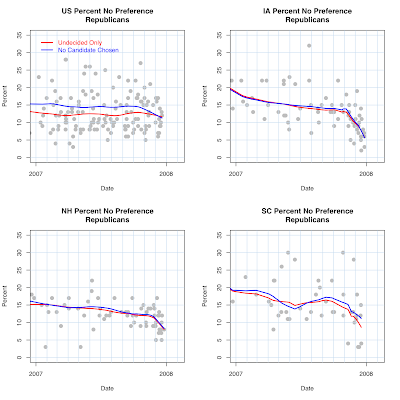 In both parties, the undecided rate has turned down the most in Iowa, to about 5% or a shade less. This is down from about 14% early in the year for Democrats and over 15% for Republicans. Even as recently as November 1, over 14% of Republicans were unable to give a candidate choice. Democrats were at about 11% undecided at that time. In both parties the undecided rate has fallen rapidly in November and December. New Hampshire also shows some fast movement to a decision. NH Dems have been steadily decreasing their don't know rate all year from 17% in January, but it still stands around 10% across the most recent polls. NH Republicans were a bit slower to choose until the first of December. Since then we've seen a rapid decline to about 8% now. And in South Carolina where there are fewer polls and the undecided rate has been all over the place, we are seeing evidence of more decision making since early November. That pattern has held for both parties, with Dems now at about 9% and Reps at around 10%. Nationally there is no trend at all in Democratic undecided rates, which have held at 10% all year. For Republicans there has been a little movement nationally, down from about 15% to about 11% since late October. Pollsters allow voters a variety of ways to say they haven't decided, so there are various ways we can measure the crystallization of preferences. One is to just use the percent who say they are "undecided", which is simple enough. But some voters, especially early on, pick options like "someone else" or "won't vote" and pollsters vary in how the report the no-preference alternatives. So I've calculated the percent who fail to choose any of the candidates the poll asks about. This is the blue "no preference" line. As it happens, these alternative measures track together pretty well, and recently any gap between them has largely vanished. You can also see large differences across pollsters in how large an undecided rate they produce. A few national polls have zero percent undecided, while the highs at the same time are over 25% for Republicans and over 20% for Democrats. This is one of the sources of house effects in surveys. There is one methodological issue that we can't address with these data. Near the end of the race some pollsters push voters harder to get a response to the vote question. That would, of course, artificially lower the "don't know" rate, and to some extent may be what we are seeing in these data. Such practices are not normally disclosed so there is no way to statistically adjust for them here. A brief break from polls to comment on graphics and politics. Today's New York Times has an op-ed by NBC's political director Chuck Todd and a graphic designed by Nicholas Felton. The text and graphic are here. The text describes the data (quite completely-- an unusual but welcome touch!) noting that candidates are stratified by time in rough line with their poll standing and that debates played a part in both the rise of Mike Huckabee and the slippage of Hillary Clinton. The graphic is a variation on a pie chart, showing the total number of minutes each candidate spoke in the 21 debates held in 2007. It is an odd fact that statisticians and analysts of statistical graphics universally hate pie charts, while graphic designers for mass media love them. The latter seem to equate statistical graphics with pie charts, while the former have ranted for years about their defects. The appealing metaphor of a pie chart is its division of a whole into parts. Whatever the slices represent, they have to add up to a "whole" pie. The trouble here is that the text and data are about amounts of time, and only implicitly about the share of a total that each candidate receives. Further, the pie mixes the two parties into one whole pie, but there really should be two pies, each divided within party and assuming we care about shares of the pies, since Republicans can't eat any of the Democratic debate pie, nor vice versa. When what we want to compare are magnitudes, rather than shares of a whole, the data are more clearly presented as distances rather than areas. It is easy to compare which distances are longer than others, and relatively difficult to see differences between the areas of pie slices, especially when the slices are not adjacent to each other. So let's look at the same data in a different format and see what we can see. The main points made in the op-ed are also evident here. There is clearly a great deal of stratification across the candidates, with front runners getting more time than the "back of the pack" candidates. But there are a few comparisons I think stand out more in this chart. The advantage of Obama and Clinton over Edwards and Richardson is clear here. Richardson got only about 2/3 of the time of Obama, with Edwards a bit better but still well short of Clinton. The next cluster of Democrats-- Dodd, Biden and Kucinich-- got only about half the time of Obama, with Gravel far behind even that. On the Republican side, Giuliani and Romney were closely matched with McCain a little bit behind. As with the Democrats, there is then a large gap until we reach Huckabee at about 3/4 of Giuliani's time. A smaller but still clear gap separates Huckabee from the cluster of Paul, Hunter, Fred Thompson and Tancredo. Another gap separates Brownback and then one more puts the short-lived candidacies of Tommy Thompson and Gilmore and the single appearance by Keyes together. To my eye, these differences are easier to perceive and compare when the number of minutes is simply the location of the dot in the chart above than when it is the area of a pie slice. There is actually more data presented in the text of the op-ed than is present in the graphic. Todd's text notes differences in number of debates by party (11 for Dems, 10 for Reps), which means Dems should have about 10% more total time available than Reps (if, that is, the debates were equal length, something we don't know from the text but see below). He also gives the data on how many debates each candidate participated in, an obviously important point since we are comparing Keyes' minutes in a single debate with Obama's time in 11 debates. For some purposes we might care only for total time, but for others we might want to adjust for number of debates. 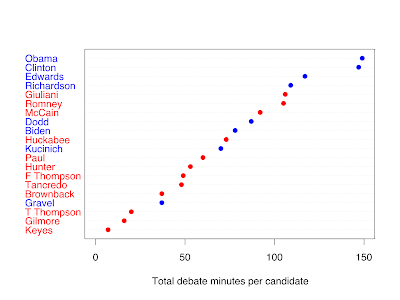 I do that in the chart below, which shows the average number of minutes per debate for debates in which the candidate participated. One immediately clear point in this chart is that Obama and Clinton retain their advantage over Giuliani and Romney even when we adjust for the extra Dem debate. Giuliani and Romney got the same time per debate that Edwards and Richardson received, but that leaves them well back of Obama and Clinton. The most important shift in the chart is the movement of Fred Thompson to the midst of the top 4 Republicans. Thompson only participated in 5 of the 10 debates, so his total time in the first chart (and the original pie chart) dramatically misrepresents the attention he received after entering the race. 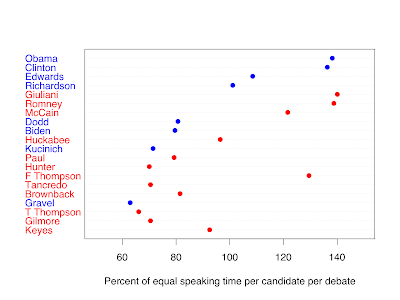 Thompson received substantially more time per debate than did Huckabee, though in 10 debates Huckabee had 73 total minutes to the 49 Thompson got in 5 debates, as shown in the first chart. In his one debate, Alan Keyes got more time than any other second tier Republican averaged over more debates. But why do Giuliani and Romney continue to get less time per debate than do Obama and Clinton? Todd's text points out that there are 12 Republican candidates but only 8 Democrats who have to divide the time. That seems reasonable, but the data are a bit more complicated. While there are 12 Republicans in the charts, three of them participated in four or fewer debates while all but 1 of the 8 Democrats participated in at least 10 debates. When we count total candidate debate appearances, the Republicans had 88 and the Democrats 81, less than a 10% difference due to number of candidates and appearances, not the 12 to 8 ratio of candidates. What is quite different is the total number of minutes the candidates of each party spoke. Democrats totaled 794 minutes over 11 debates, a total time per debate of 72.2 minutes of candidates actually speaking. For Republicans, the total in 10 debates was 666 minutes, or 66.6 minutes per debate. So the Democratic advantage in the original pie chart and my first chart above has built into it a longer total for Democrats regardless of the number of debates. Let's adjust the speaking time to show which candidates got more than their fair share relative to the time available per candidate per debate. In this case, 100% means the candidate got exactly the "fair share", or 7.6 minutes per debate for Republicans and 9.8 minutes per debate for Democrats. On this scale, leading candidates got up to 140% of their party's fair share, while the lowest share was 63%. This new scale now removes the differences in total time between parties, and lets us compare relative advantage or disadvantage between parties and candidates. The data are plotted below. Now that we are no longer confounding differences in total time between parties, new perspectives emerge from the data. 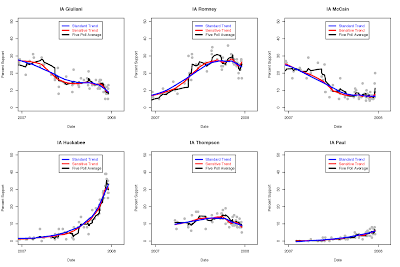 The top two candidates in both parties were equally advantaged-- all four got about 140% of the time that an equal time rule would have given them. The previous comparisons masked this due to the shorter Republican times. But relative to a fair division of time, the top two were treated almost identically in both parties. But the 3rd and 4th places were treated rather differently. In the Republican debates, McCain and Fred Thompson received about 120% of a fair share, while on the Democratic side Edwards and Richardson got only slightly more than a fair share would entitle them to, Richardson at 101% and Edwards at 109%. Based on this share of time comparison, then, the debates treated the Republican race as more of a 4 person contest, while the Democratic debates divided a top 2 from an "average" third and fourth. The extra shares for leaders must come, of course, from the rest of the pack. Huckabee who now threatens to win Iowa has received only a 96% share of a fair time allocation. The bottom 5 among Republicans all got less than 80% shares. Among Democrats the gap between Richardson and the rest is from 101% to 80.7% and below. So total time favored the Democrats, but did so even after adjusting for number of debates and debate participants. The separation into top 2 vs 3rd and 4th was especially clear for Democrats. The Republican race gave relatively more time to 3rd and 4th place candidates. The front-running Democrats, thanks mostly to a smaller field (but also to one additional debate), got a lot more time to speak than the front-running Republicans. Not surprisingly, the times for each candidate seem to follow the polls, with the leading contenders getting more minutes. As Mr. Huckabee’s poll numbers rose, his speaking time increased. The debates had effects on both voters and candidates. Mr. Huckabee’s performances helped him emerge from the pack, and a few tough moments for Mrs. Clinton set the stage for her eventual fall in the polls. The first point is right that Dems got more time, as the charts all show. But that advantage wasn't entirely due to fewer candidates and one more debate. 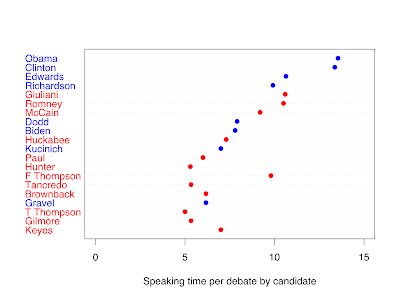 The advantage was more real than that: Democrats got more time to speak per debate and per candidate. Changing the graph allows us to see this in a way the pie chart did not. Also revealed by the charts here are systematic differences between candidates that illuminate the nature of the stratification within and between parties. Front runners are advantaged, but the Democratic race was treated as having 2 clear leaders while the Republican race had 4 apparent contenders, based on speaking time. That too is masked by the pie chart. Finally, two of Todd's three points above are not addressed by the graphic or the data given. While it is clear that the order of speaking times roughly follows support in the polls, this is not entirely the case. For example Biden has more poll support than Dodd, yet Dodd got slightly more speaking time. (For that matter, and more powerfully, Clinton held a large lead in the national polls during almost all of the debates, yet trails Obama in total time.) Moreover, the dynamic element Todd mentions is not illustrated by the graphic at all. If Huckabee's speaking time rose with his polls we can't see it here. And did Thompson's time drop with his polls? Alas, the op-ed doesn't list these data (which would be quite lengthy.) But a graphic could have illustrated this dynamic aspect of the data in no more space than the pie chart. Nor does the pie chart provide any evidence of the role of debates in the rise of Huckabee or the decline of Clinton. Did the polls move up or down noticeably following any of the debates? Did candidate time in one debate precede a rise in polls, or did a rise in polls precede more speaking time? We could see these things in a graph, but it would take well more than a thousand words to describe them. The better the graph the more words it is worth. A new American Research Group (ARG) poll of Iowa has caused quite a debate in the comments at Pollster.com. Today Mark Blumenthal takes a close look at polling the "Dark Side of the Moon" in Iowa during the holiday season and the unknowns involved, including the unknowns of the ARG poll. So while the pollsters are busy trying to get one more Iowa poll in this week, let's look at the track records of the pollsters in Iowa. The chart above shows the polling of the Democratic nomination race in Iowa since January. In 2007, twenty four different polling organizations conducted Democratic caucus polls. Of these, only 7 have conducted three polls or more. That means that for most pollsters, we have no way to separate random error from systematic "house" effects. To do that, we need multiple polls, and to do it reliably we need a number of polls from each organization. But we can at least look at the seven organizations with three or more polls, and see how they compare to the trend estimates. The trend, of course, reflects the best estimate across all pollsters, but until we see the actual vote (itself a very slippery concept in Iowa) we can't say if the trend was better than individual polls or not. 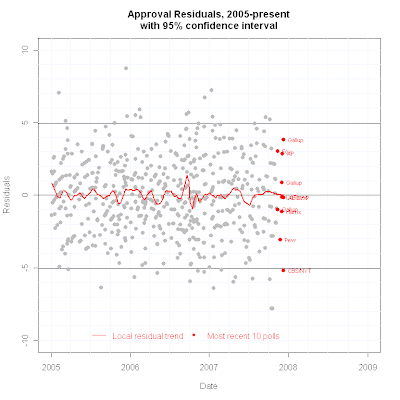 Still, this reveals when pollsters seem to follow the trend and when they systematically seem to miss it. The clear result of the comparison above is that ARG generally showed a much better performance for Clinton than the trend in the first half of the year. 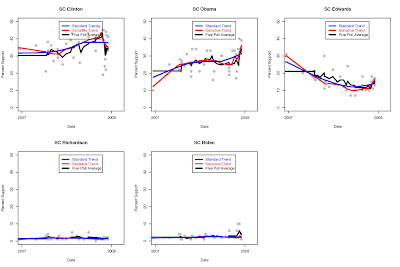 From January through June, ARG usually had Clinton some 6-10 points above the trend estimate, with one exception in which ARG agreed almost exactly with the Clinton trend. 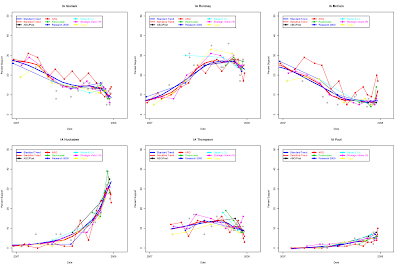 During this period, ARG was the most discrepant of all pollsters from the Clinton trend. In the second half of the year, ARG's polling has generally been much closer to the trend estimates, usually less than 4 points away from the Clinton trend. During this time ARG has mixed in with other polling pretty consistently. That is, until the most recent December 20-23 poll, which again shows a large Clinton deviation of about +6 points from the trend. (I'm using the standard blue trend line. The upturn in the red "sensitive" estimate is interesting, but it is also sensitive to the ARG poll, an example of why you might not entirely trust the red estimator.) This is the first large ARG deviation recently, and quite a change from ARG's previous poll of Dec 16-19 which was close to trend. ARG's polling for Edwards has been more variable. 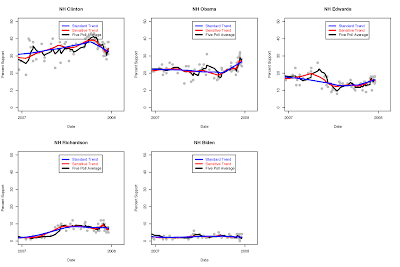 Early 2007 polling fluctuated quite a bit, sometimes below and sometimes above trend. More recent ARG results for Edwards has generally been a few points below trend, with the latest result about as much below trend as has been "normal" for ARG recently. 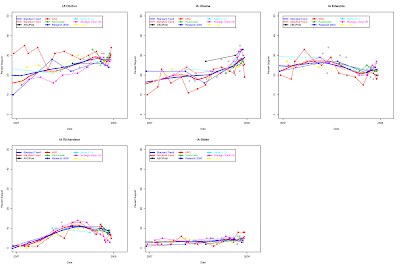 ARG's results this year have been more heterogeneous than some oversimplifications claim. There was a substantial overestimate of Clinton early in the year, along with an underestimate of Obama's support. That was important during this period because there were relatively few other polls available for Iowa in this period. 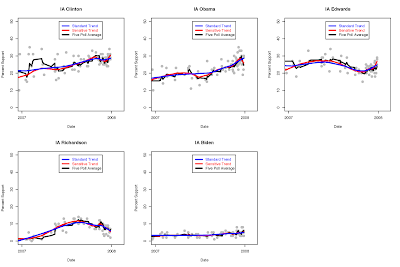 But in the second half of the year, the ARG results for Clinton and Obama have been much closer to trend estimates, though still with a small average advantage for Clinton and small disadvantage for Obama. In light of this, the ARG poll for December 20-23 does look out of line with their own previous polling, certainly their polling of the last 4-5 months. Let's look at their Republican results for Iowa. On the Republican side, ARG's results have been especially favorable to John McCain, and to a lesser but still substantial degree to Giuliani. Unlike the Democratic results, these effects have not diminished much in the second half of the year. McCain has often been as much as 10 points above trend, with only one poll below trend and one more right on the trend. No other pollster has been so consistently far from the trend for McCain. For Giulinai, the results are less far from trend, but still quite consistently above trend. Only 2 of the last 10 ARG polls have Giuliani below trend. 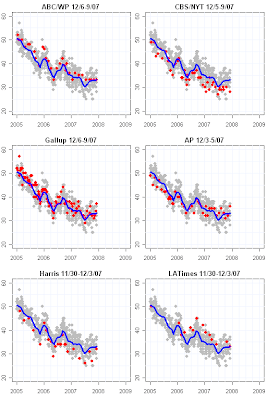 Romney has fared close to trend in the ARG surveys, though on average a bit below trend. The discrepancies for Romney are much less dramatic than for McCain or Giuliani. The last two ARG polls show shifts of -3 and +4 points for McCain and Romney respectively, and a single point difference for Giuliani. (And a -5 and +6 for Huckabee and Paul.) For the Dems the shifts were +5, -6 and +2 for Clinton, Obama and Edwards respecively. As Mark Blumenthal notes, the reasons for these discrepancies are largely matters of speculation. But the consistency of the ARG house effects are pretty clear in these data. 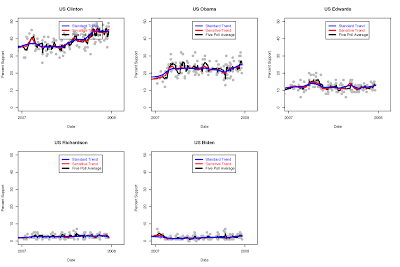 The ARG results currently stand on the same side as their long term house effects: above trend for Clinton, Giuliani and McCain, and below trend for Obama, Edwards and Romney. Compared to other pollsters, these house effects for ARG appear to be the largest of any polling firm in Iowa. Lots of exciting movement in the polling in both parties has pushed me to review the bidding on trend estimators. As regular readers know, the "blue" line estimator that is our standard is deliberately tuned to be a bit conservative. It requires a good bit of evidence that a change in direction is "real" before the trend will move sharply. With lots of polling, this estimator has an excellent track record of finding turning points of opinion while not chasing wild geese. But in a hot primary, with relatively few polls each week (this week has been an exception!) it is reasonable to ask if there is short term change taking place that "old blue" just isn't quick enough to catch. So let's take a look at two alternatives. So let's think of the single most sensitive alternative estimator we could pick: the latest poll. That would certainly move rapidly, and so be "responsive". But it would also reflect individual "house" effects due to polling organization and practices. It would also be highly unstable as an estimate of support, because individual polls vary over that approximate +/- 5 point or more range we see in the plots. In effect, this most sensitive possible estimator would just connect the dots and produce a plot that looks a lot like an earthquake on a seismograph. Lot of noise, but hard to see the systematic trend. So we'd like to smooth out this random variation (and non-random variation due to house effects). One option is to take a rolling average. The more polls in the average the smoother the result, and you can take your pick of 5, 10 or more polls to smooth over. Of course, the more your include in the average, the more out of date the average is because it includes some polls taken a while back. I've chosen a 5 poll average here, because it should be quite sensitive yet still gain some of the advantages of averaging. Using more polls would smooth more, but defeat the purpose of having an especially sensitive estimate of trend. So what do we see when we compare these estimators in IA, NH, SC and the US? For the most part, all are in substantial agreement about big trends over the full year. The red line and black moving average show more variation than does blue, and may have picked up some "real" short term change that blue considered noise. But over all the 44 state x candidate x party comparisons, the agreement among estimators is pretty close most of the time. 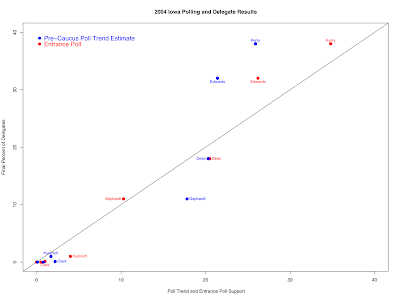 For the Dems in Iowa, all three estimators are in quite close agreement right now. The differences are in the range of a point of each other. A sharp eye can see some differences of trajectory. 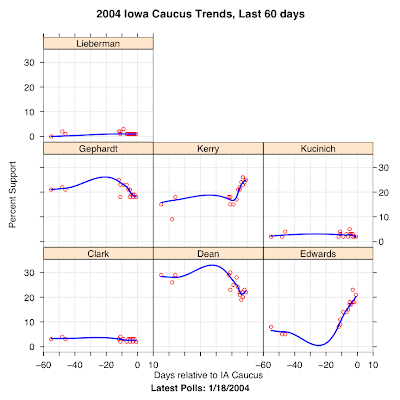 For example, Clinton in Iowa is trending down in the blue estimator, while red sees a very recent upward trend while the black moving average fluctuates erratically. But zoom in and the differences are about a half a point or so. My experience is that you just can't reliably estimate such small differences, but feel free to make your own call here. On the Republican side in Iowa you see similar agreement with small differences near the end. 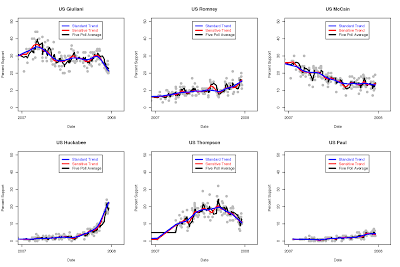 Small differences for Romney and Huckabee are seen in comparing red and blue estimators-- Red and the moving average see a bit of upturn for Romney and downturn for Huckabee in the most recent polls that the blue estimator isn't convinced of. As with the Dems, none of these differences is very large. In New Hampshire, the picture is essentially the same for the Dems. Blue sees Clinton moving down, Obama up and Edwards gaining more slowly. Red and the MA think Clinton has turned back up in the last few days, while Obama has stalled or turned down. But all these differences are again matters of at most a percentage point difference in estimated current support. For Republicans in New Hampshire, there are somewhat bigger differences for Romney and McCain, though the trends agree for the other candidates. Red and MA think Romney took a turn down recently by as much as a couple of points, while blue sees a continuing upward trend. The blue and red estimators are still within 2 points of each other, but a real difference in upward or downward momentum would, of course, be important. For McCain, the latest couple of polls show a substantial spike in support, and red and MA chase that spike, leading to the largest difference we've seen so far among the estimators. All three see McCain gaining, but red puts him about 4 points higher than does the standard blue trend, while MA is a point lower than red. In South Carolina where there has been less polling and more noise, we see the biggest differences of all. It is worth appreciating what a huge range of results we've seen in recent SC polling for Clinton and Obama. I am not willing to believe that the true level of support has really varied between 20 and 45 points! 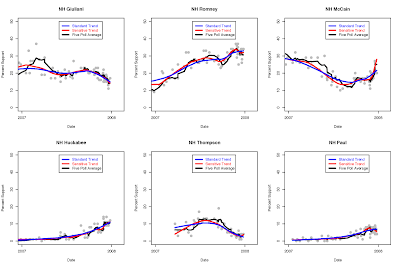 But this makes the estimation especially tricky (and is why I prefer the stability that the blue estimator provides in the face of extremely noisy polling. Blue sees Clinton as flat for some while, in the process splitting the difference between some quite high polls and other quite low ones. Either her support has suddently collapsed (but with simultaneous high and low polls) or the best bet is what the blue line estimates. Red and the MA in contrast see a downturn recently from about 43 to about 35, a major drop. For Obama, all three see an upward trend, but with red and MA moving up much more sharply than blue. Blue puts Obama at 31, while red would go for 35 or 36. For SC Republicans the big difference is with Huckabee, where red and MA see a very large recent gain, while blue agrees on the sharp trend but doesn't put the support as high yet. Blue puts Huckabee at about 20, while red and MA would go as high as 28. There are small differences of recent trend for Romney and Giuliani, but these are quite small-- more on the order of the Iowa differences. Finally, on the national scene, we gain the advantages of more dense polling. The Democratic trends are quite close to one another. And on the Republican side, even the rapid rise of Huckabee is picked up quite well and with close agreement among all three estimators. The bottom line is that most of the differences we see among the estimators are small-- on the order of a point or two in the estimates. The apparent differences in the most recent trends strike me as generally being too small to reliably distinguish. What constitutes a "real" change in trend is hard to define, but I think most of the current differences are too small to put a lot of faith in. But the bottom line is this is a fun game. I'll be updating with all three trend lines so you can pick your favorite and place your bets accordingly. Starting January 3 we'll begin to see how the polls and the trends line up with actual votes. President Bush's approval rating remains about where it has been for several months: 33% plus or minus a fraction. The current trend estimate is 33.2%, including December polling from LATimes/Bloomberg, AP/Ipsos, CBS/NYT, ABC/WP and USAToday/Gallup, the last from 12/6-9/07, finding 37% approve and 58% disapprove. 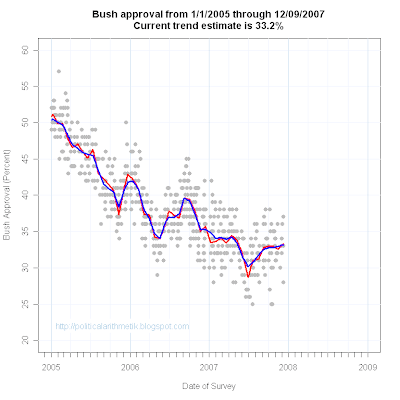 This now represents one of the longest periods of stable approval for Bush. His presidency has been characterized by a long decline from the post 9/11 highs, interrupted by generally short rallies and spikes due to the start of the Iraq war and the capture of Saddam Hussein. The most important exception has been the long rise in approval starting in March 2004 and continuing through the election in November of that year. The second term has been marked more by long term decline, but with rallies up in late 2005 and the late spring and summer of 2006. Rarely has support simply held stable, neither rising nor falling. The only period of nearly comparable length was the winter and early spring of 2007, when approval held at a steady 34% for nearly 4 months. The current plateau at around 33% has now lasted slightly longer, starting a rise in late July and stabilizing around 33% by September. Since that time, trend estimates have varied within less than a percentage point of 33%. The current polling shows considerable variation, from a low of 28% in CBS/NYT to a high of 37% in the latest Gallup poll (both taken within a week of each other.) The CBS/NYT just barely crosses over into outlier territory in the residuals plot below. Even with these two extremes removed, the remaining polls also balance around 33%. 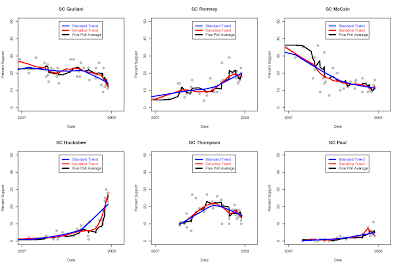 The final plot below shows that the sensitive "red" estimator is in agreement with the more conservative "blue" standard trend estimate. Neither see much change in recent polls. If you want dynamic exciting polling, better turn to the primary races.